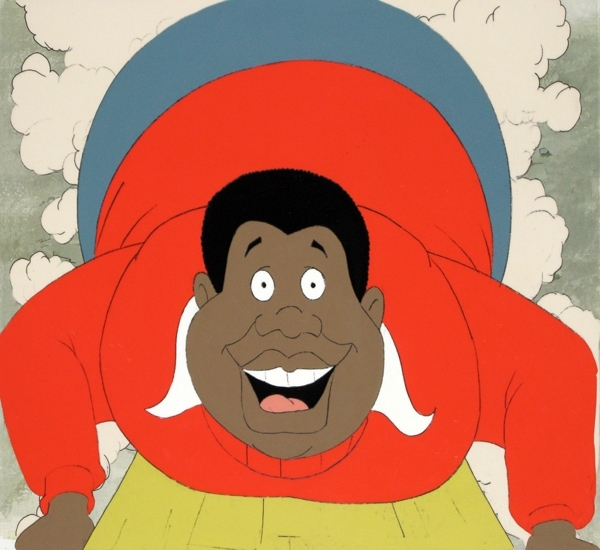 In an undated handout image, Fat Albert, from “Fat Albert and the Cosby Kids,” a cartoon that ran from 1972 to 1985. The proprietors of the Museum of UnCut Funk, an online and traveling exhibit celebrating black culture of the 1970s, say that Fat Albert and other cartoons of the era represent more than entertaining nostalgia, but also the fruits of a struggle for equality and representation. (Collection of Museum of UnCut Funk via The New York Times) — NO SALES; FOR EDITORIAL USE ONLY WITH STORY SLUGGED BLACK-ANIMATION-EXHIBIT BY LEE. ALL OTHER USE PROHIBITED. Saturday morning cartoons won their hearts. Loreen Williamson, in Rochester, and Pamela Thomas, in the Bronx, would park themselves in front of the “The Jackson 5ive,” featuring a tiny Michael sporting a big Afro, and “Josie and the Pussycats,” with the black tambourine-playing Valerie Brown performing in a hip girl band. Eventually, the two met and bonded over their mutual interests. Not content to leave the funk (or their pasts) behind, Williamson, now 49, and Thomas, 51, have amassed more than 300 pieces of black animation art from the 1960s and ’70s, a collection that they believe is one of the world’s most extensive in that field. In 2007, they created the Museum of UnCut Funk, an online showcase for original animation cels, posters, storyboards and other objects celebrating black culture of the 1970s and its standard-bearers. Now, the two collectors have hit the road with a traveling museum exhibition, “Funky Turns 40: Black Character Revolution,” which represents 24 animated productions, including Saturday morning and after-school cartoons and animated feature films. The programs are more than entertaining nostalgia, the two curators and some cultural historians say. They represent the fruits of a struggle for a say in the representation of blacks in television images, among other rights, and the newfound ability of popular black entertainers to get such programming on the air, based on their own appeal to a wide audience. The shows offered a striking counterpoint to the previous stereotypical portrayals of blacks as buffoons in mainstream films, books, theater, advertising and cartoons. It was no accident that “Hey, Hey, Hey, It’s Fat Albert,” described by curators as the first “positive” black-cast cartoon on TV (and the basis of the later series), was an NBC prime-time special in 1969, or, in the same vein, “The Jackson 5ive,” the first Saturday morning cartoon series featuring black musicians, made its debut in 1971. Both were created by two entertainment powerhouses, Bill Cosby (Fat Albert and the gang were part of his stand-up comedy routine) and Berry Gordy Jr., the founder of Motown Records, who marketed the family music act to appeal to the broadest possible audience. She and Williamson are also avid collectors of blaxploitation film posters and of comic books, stamps and coins with an African-American flavor. The women, who met in 1997, founded an art and animation gallery that they ran as partners from 2000 to 2003 in Summit, N.J. They also sought to bring their art and their historical perspective to the attention of museums. But black history exhibitions typically focused on the most tumultuous aspects of the civil rights struggle, and animation is a far more accepted museum subject in Europe and Asia than in the U.S. Eventually, Thomas and Williamson convinced curators that the Saturday morning children’s cartoons reflected an important but overlooked positive moment. “At the same time, everybody had a big Afro, and they were saying black is beautiful. You began to see that in TV and film, and you also had this revolution in black animated characters,” Williamson said.